Pinterest has always been a puzzle for me because one day I see a hike in traffic and on another day, I rarely see any of them. I am sure you must have felt the same. It kinda makes me scratch my head to figure out what this mystery is all about. What am I doing wrong, which isn’t giving me any traffic and at the same time what am I doing right? Now, I have been using Pinterest for more than a year and haven’t seen any huge spike in traffic. It doesn’t mean that I don’t get any traffic. Sure, I get. I had a pin which went viral that gave me hundreds of visitors straight for 3 days. But after that, all came back to normal. In short, I always had a good and bad relationship with Pinterest. It’s like one day I am seeing my Pinterest graphs going up and on another day, it’s literally the opposite. But after doing quite a research that includes taking a Pinterest course as well. I came to the conclusion that I was missing a few things that weren’t included in my Pinterest strategy. So, when I started implementing them, I saw my Pinterest analytics starting to take off that resulted in more blog traffic. Now, I am not here to talk about choosing a business account, applying SEO & other things. Though they are very important to build a good foundation, but I have already talked about it in the following article. What I am going to discuss here is something different. So, if you are keen to know what I have to share, then keep on reading. 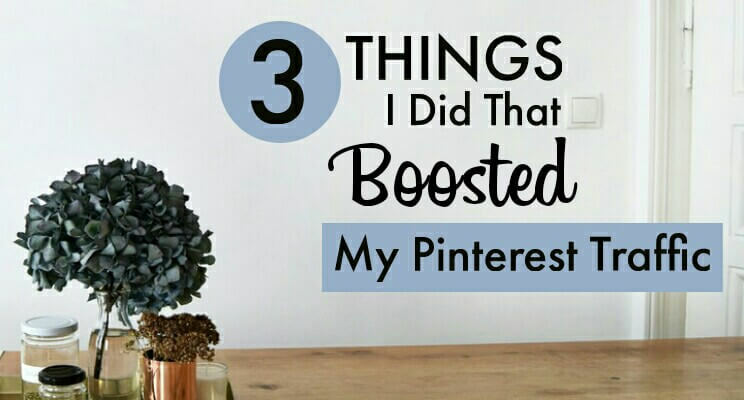 Now, I have been doing some experimenting lately with Pinterest & based on that, I am going to share 3 things which really changed my Pinterest game. Do you know which boards help my pin to get seen? No, it’s not group boards. Though, they do help but not as much as I thought. Actually, my pins get a lot of impression due to my personal boards. The boards which I have created. You see, I recently read an article where Pinterest has revealed that they love personal boards over group boards. This means if you create personal boards related to your niche with well-keyworded title and description, you don’t need any group boards. However, if you are new and don’t have many followers, then I will suggest you join group boards because you obviously don’t have an audience in the form of followers. If you check my analytics, the top 5 boards which give my pins the maximum impressions are all personal boards. The reason why personal boards do better than group boards is that you have total control over them, which isn’t the case with the other one where anybody can pin anything. A board can only be successful when it is filled with related pins. For example, if I have a board related to mobiles, then I make sure that I only save pins related to mobile phones. However, if I start saving pins related to TV or Refrigerator, then it may hamper the visibility of that board & that’s what happens with group boards. So, make sure you start creating more personal boards with good keywords. Now, to be honest, you can’t expect to see better traffic if you create only one pin for your post. You see the Pinterest algorithm is unpredictable sometimes. You may think that this particular pin will do good, but instead, it won’t generate results as you expected. It happened to me quite a lot of time when I taught that I made the best pin ever, but was sad to see only a few people coming to my blog. 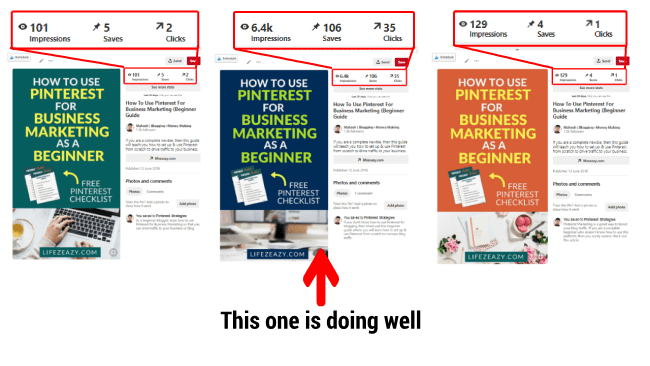 So, I bought the Pinterest Strategies ebook and started applying the methods mentioned in that course. I created multiple pins and started repinning them by targeting keywords. And guess what, it worked. 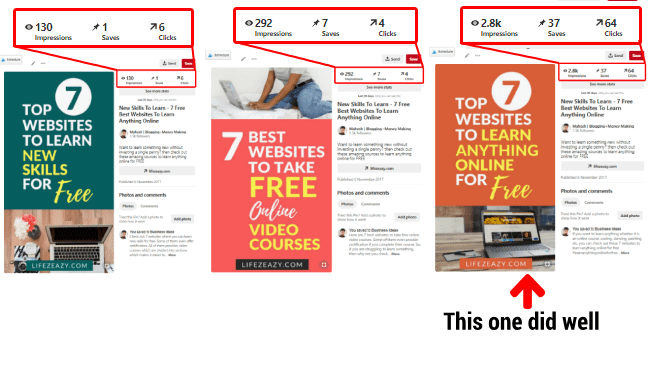 For every blog post, I created at least 3 pins and sometimes, even 5-6 pins because you never know which pin will perform better. If you see below, I have created 3 pins for the same post with different headlines and colors. Out of 3, one of them started bringing me traffic. Do note that below pins are only 2-3 weeks old and one of them has started growing well. You can also see another example, where I only changed color and background picture with the same title and guess what you can see the difference. Please note that I have targeted different keyword with each pin. For example, I targeted the “Pinterest for business” keyword with the green pin. For the orange one, I targeted “Pinterest for bloggers” and for the blue one, I targeted “Pinterest for blogging”. As you can see, “Pinterest for blogging” keyword is the one that has started doing well. So, the whole point is, you need to start creating multiple pins targeting different keywords for each post and start saving them in well keyworded personal & group boards. You will surely see a better result. When you create a pin, you start pinning it to your boards & group boards. What should you do to make Pinterest happy that they start showing your pins more to others? To be precise, you need to repin your pins which others are saving in their board. I know your first question will be where do I find them? Well, just look up your notifications & activity page. There you can find your own pins that are being repinned by others. Click those pins and save it to your boards. That’s all you need to do. However, make sure to check the board in which they have been repinned. If the board is relevant, then only re-pin it into your board otherwise move on to the next one. If you start implementing this step, I am pretty sure you will see better results. You know, Pinterest doesn’t pay much attention when you repin your own pins from your own boards. However, if you repin your own pins from other’s board, you will see a much better difference. Well, these are a few things you must consider while using Pinterest. 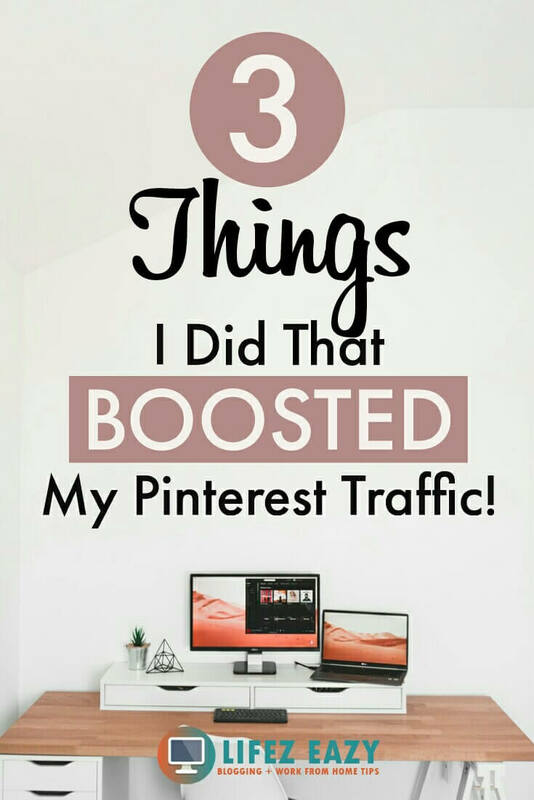 It has helped me a lot to boost my Pinterest traffic. 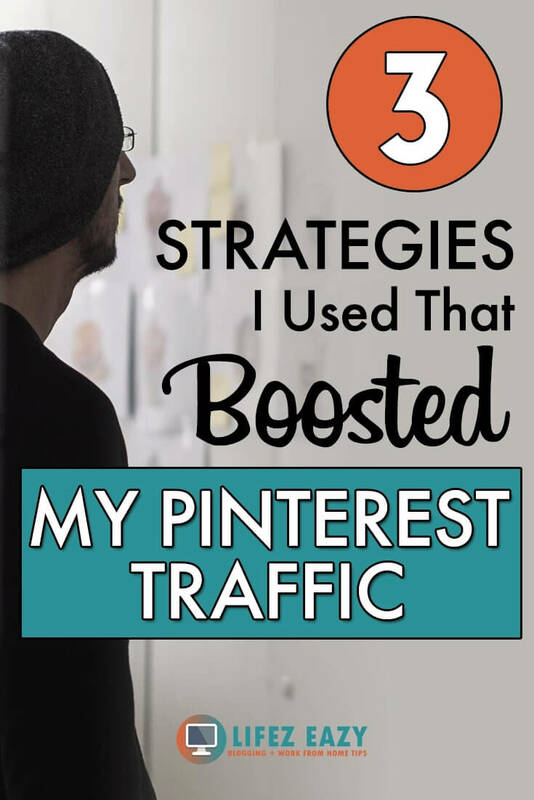 Not only that, Pinterest Strategies has been a savior for me because it has taught me the right way to use this traffic generating machine (Pinterest) which many of them are actually doing wrong. If you are interested to read my review on this course, then do click on the link. With that being said, I hope you liked this article. If you do then don’t forget to share and pin this article. Cheers. I’m all about trying to grow my pintrest following, so this is super perfect for me right now. I hadn’t been doing the first pin, so I’ll start doing that as of today. Thanks! Great to hear that Jo. Best of luck. Hi Mahesh – I recently read Kayla’s book it found it super helpful as well. Thanks for sharing these tips. Yeah, Nicole. it’s an amazing e-book & you’re welcome. This is really awesome! Pinterest is still a beast I have yet to tame when it comes to my blog. I want to get better at it but there are just so many things to focus on. Thank you for the tips. Yeah Echo, there are so many things on Pinterest which sometimes becomes quite overwhelming. 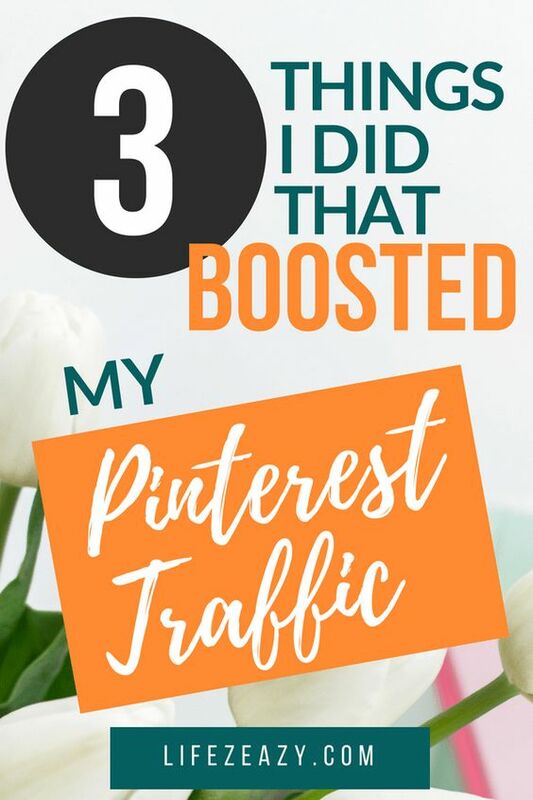 But the best thing you can do is to use just one strategy at a time for one week and see whether there is any change in Pinterest traffic. If not, then skip to another strategy. Love this! Manual pinning isn’t something I’ve been wanting to try but just felt like it was too complicated and time-consuming. I love the idea of being able to do it on my smartphone without any sheets! Yeah Kate, it’s definitely a great strategy. I just started the free trial with Tailwind and am loving it so far! But you’re completely right about how many pins have missing or broken links! These are great tips because Pinterest gives me a bit of a headache because I genuinely don’t understand it! Yeah, Pinterest is sometimes confusing. But, we need to keep on experimenting. I haven’t tried pinning the trending pins yet, but that makes sense that it will help. Thanks for the ideas! I have had mixed success with Pinterest but I like your recommendation about pinning trending pins. This makes sense and I’m going to give it a shot. Thank you! Definitely some great ideas I would want to try. Thanks for the knowledge! Great tips here! Pinterest is so confusing.